Location of the Story: London, England during the 1930’s Depression. The Story: An unlikely hero (tall, middle-aged Henry Gibson) and an unlikely heroine (angular, past her prime Dolores Diver) meet at a Chelsea Arts Ball dress ball dressed as a brown-paper parcel and a Spanish dancer respectively and instantly fall in love with one another. Between them grows a fairytale romance dominated by the passion of ‘King Hal’ (as Dolores lovingly calls him) and the exotic beauty of his ‘Spanish Rose’. Despite their differing social circumstances, which prevents them from marrying, they come to a happy unlawful arrangement by which Harry leases a house for Dolores in 5 Alcock Road, (a shady part of London) and visits her two days a week on the pretext of work. Though the arrangement sounds illicit, to King Hal and Dolores nothing can besmirch their beautiful romance. Thus continues this state of affairs until Dolore’s estranged brother dies, leaving no-one to care for his orphaned daughter Martha. Martha arrives in her aunts household at the age of six, a strange unemotional child, with a large appetite and a penchant for drawing objects. Martha is aware of a relation of sorts between her Aunt and Mr. Gibson but as Mr. Gibson never presumes to encroach upon Martha’s personal space, all three of them get on very well together. Harry and Dolores’s domestic bliss is shattered when Harry is forced to accept the hand in marriage of Miranda Joyce, whose father is an affluent businessman. He does this in order to save his failing business. With a heavy heart Harry and Dolores break off their liaison and try to resign themselves to the prospect of leading loveless lives, away from one another. Harry tries to piece his business together during the daytime, surrounding himself with objects that remind him of Dolores and his heart sinks at the prospect of dining every night at the Joyce residence. His only ally is his future father-in-law , Mr. Joyce, with whom he develops a great camaraderie. He also promotes this friendship to minimize his personal time with Miranda Joyce, who annoys him tremendously and reminds him more and more of how much he adores his ‘Spanish Rose’. Dolores on the other hand tries to pull together a source of income for herself and the child Martha now that she is no longer benefiting from the largesse of Harry Gibson. She is unsuccessful in every attempt of securing a job she embarks on. She realizes that after a decade of shutting herself up, with no-one but King Hal to grace her world, she is all of a sudden very alone, friendless and without the resources to fend for herself. There is the rent to pay, food to put on the table to meet the appetite of the ever-hungry Martha and other bills to pay. In the evening, she locks herself in her inner sanctum-sanctorum -the small sitting room filled with objects of art that Harry had bought her. The very place where she and Harry would spend their evenings together. She spends her time pining for Harry. It is at last left to Martha, to find the perfect answer to all their economic problems- an unobtrusive lodger- Mr. Phillips. All is well until Mr. Phillips delves too much into Dolore’s past and tries to manoeveure her into a marriage of ‘convenience’. Can circumstances bring King Hal and Dolores together again? The prospects look bleak until Miranda Joyce’s insatiable curiosity gets the better of her and she plans a reunion of the Spanish Rose and King Hal under the most uncomfortable of situations. Miranda Joyce in doing so underestimates the very great power of ‘the eye of love’. Conclusion: ‘The Eye of Love’ is a terrific story that is easy to read, enjoyable and funny. Margery Sharp writes with great candour and has a flair for developing unusual, unorthodox characters and plots. The book is out of print at the moment. 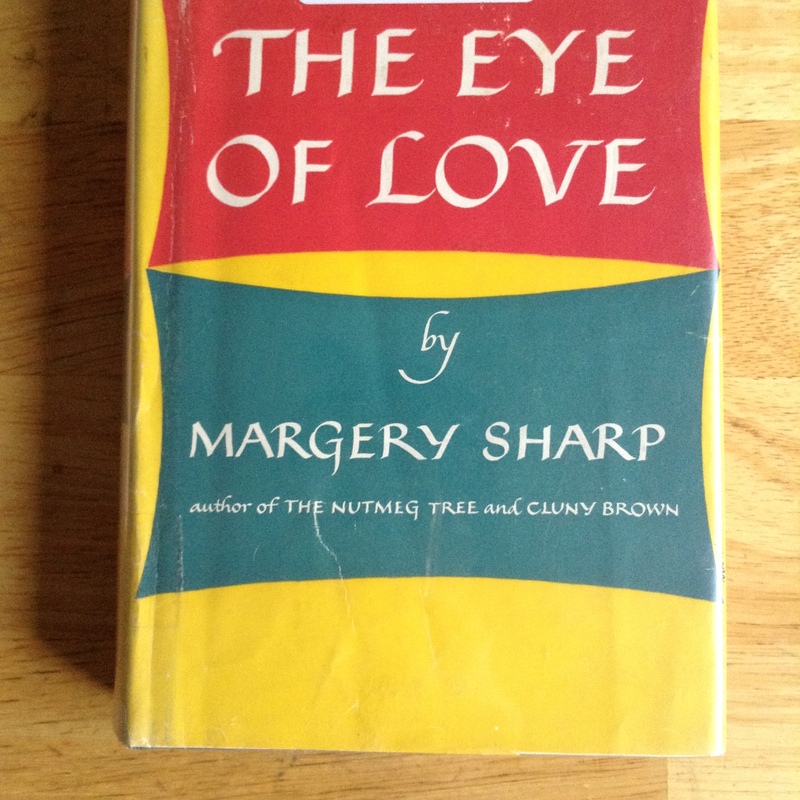 I do hope this book and more of Margery Sharp’s work will become available in future. It would be a shame to lose the writings of such a gifted story teller. Thanks Resh. I think you will enjoy it!